The most famous slogan in this epoch to the eR users is "Fix Economy!". principally by the current and terrible overproduction. And, of course, all people have, more or less, a correct definition of Economy, but, by the same reason, to me is ununderstandable why does it proposed so many ideas (rise gold price, bring back the market bot, more taxes) that doesn't attack the very core problem of the economic module in eRepublik. Hence, my suggestion is simple: to fix the economic module in eRepublik, we have to go back to the basics. And for "Back to Basics" I don't mean the V1 or the Rising versions of this game. I mean to apply the very basic definition of Economy. As you can see in the rectangule, those two words,applicated in this game, would represent an overwhelming change in that module. The main problem here is: the New World is the dreamed world in economical terms. in the New World, the agricultural soil never erodes, resources like the oil, the saltpeter, the iron, the aluminium are extracted from endless mines or rigs, the abroad oceans, forests and farms are plenty of fishes, deers or cattles with an very high reproduction rate, it is non-existent things like "natural disasters", "hurricanes", "earthquakes" or "tsunamis", and words like "climatic change", "greenhouse effect", "biodiversity" or "sustainable development" doesn´t have any sense or meaning. All these things make me remember about some anti Mc-Donald activists game where, citing their developers, "Behind every sandwich there is a complex process you must learn to manage: from the creation of pastures to the slaughter, from the restaurant management to the branding." (I'm sure some people here had played that game). Putting aside the learning about "labour explotation", "capital acumulation", "health risks" and other speeches, the objective in this game (with plenty of similitarities with the eRepublik production chain) is, as the player simulating to be the Mc-Donald CEO, the management of all the Mc-Donald production chain, from the raw production (cattle raising, animal breeding, feedlot), passing by the manufacture (livestock slaughtering, preparation of the product), distribution (points of sale) to the consume promotion (advertising, marketing), with the ultimate goal of to generate constants upwards profits to the shareholders assembly. Of course, this is, on the other hand, the game trap: those shareholders will demands more and more profits, but the primary resource of your company, the cattle raising, remains over soil with high risk of permanent erosion, so if you weren't careful enough, very soon you would encounter all your available soil irreparably eroded, thus leading to the company at bankruptcy. In my case, however, I could be careful enough to avoid that and, hence, I create a sustainable production model that generate profits, ignoring the complains and demands of the shareholders because I knew that, otherwise, I would fall in the game trap. I think the same logic can be implemented in the economic module in eRepublik. Of course, I'm not talking about to create "natural disasters", but certainly I propose landing economically the New World to the reality, where the weapon raw materials and the food raw materials aren't created as if by magic, giving us the impresion the New World is plenty prosperous and inexhaustible, but inventing some historical, geological or UFOlogical excuse to say the New World's economical resources, surprisingly, becomes scarce, leaving to the ecitizen the task to guarantee a sustainable development in his country economy. To put an example, let's talking about my country, eColombia. 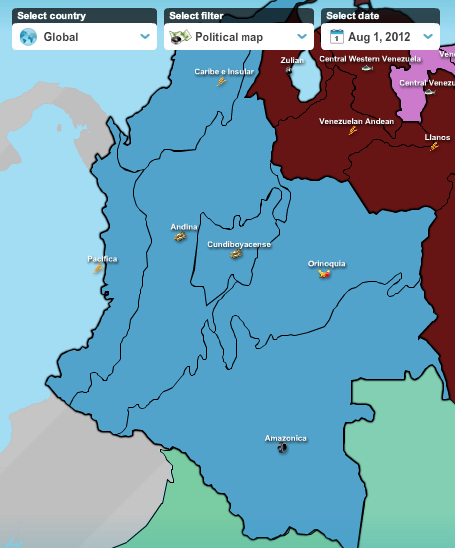 As you can see, eColombia have two grain regions, two iron regions, one fruit region and one rubber region. 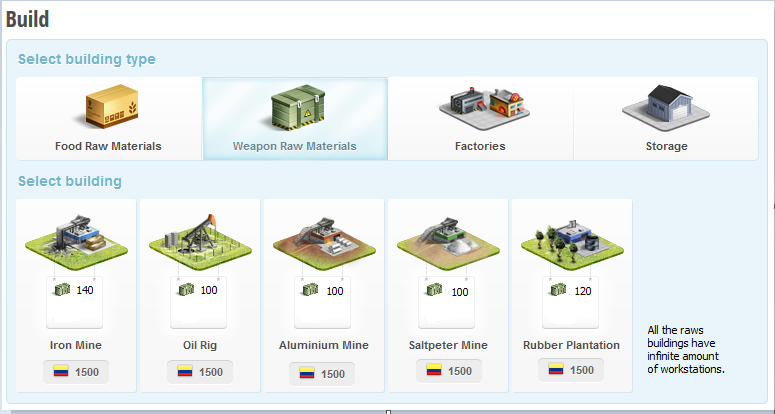 Now, as other propose to the game, let´s make worth all those regions eColombia have in the raws building type. But other alternative could be to keep the production normally without gradual loss by RA percentage. 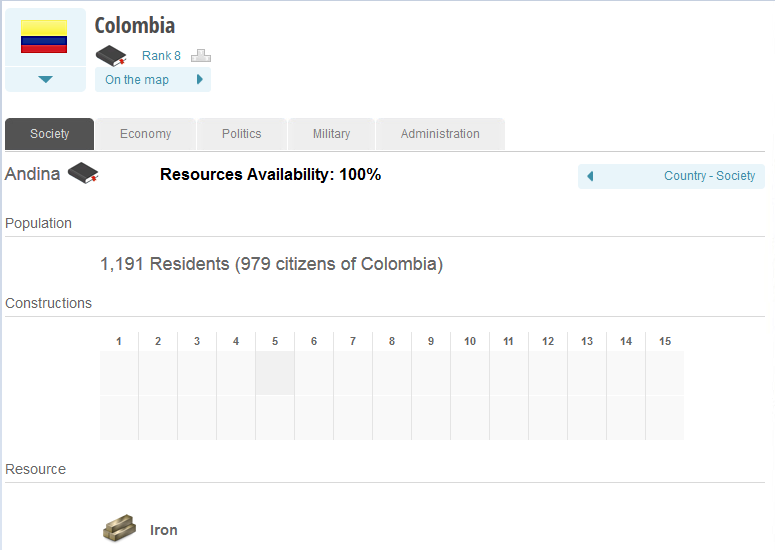 And of course, if that percentage is 0%, it means the region had been exhausted of their resources. Hence, no raw building would produce raw material in that region. The mentioned "resources availability" would be determinated by the number of raw buildings working in that region and the number of employees of that buildings, in a directly proportional relation (the more the amount of building and employees working in the region, faster the drop of the resources availability percentage.). However, the region can slowly recover their economical resources, although that would depends of the raw buildings' will to let recover it, using less buildings or employing less users. Even it could be found an equilibrium between the number of buildings and his employees, and the percentage aforementioned. Of course, all this system would force the governments to ejecute policies intented to enhance their regions sustainabilities, both the core and the conquisted ones, becoming, en passant, in a new argument for the military module. In the other hand, to apply the percentage, the raws buildings will have written his location and theirs transfers to other regions must be paid with a susbstantial amount in golds or currencies. The expected effect, of course, is a strong fall in the raw production (at reasonable levels, I expect), the price raising in the raw materials and manufactured products (Food and Weapons) but, in the overall, the full existence of a economical module, based in the reality and not in fairy tales. I think the post is already too long so let it be here. Edited by Demonaire, 16 August 2013 - 05:22 PM. What a great post dude! De verdad que te esforzaste, aplicaste la realidad al juego. Tal vez sea un poco complicado de implementar, pero es una solución alternativa a las que siempre se proponen. for instance my country Australia, has massive physical size regions but few of them, would that affect the sustainability? or how about the USA, it has many many regions but in RL isnt that much bigger than Australia, so if it was purely regions than USA would have a huge advantage. The way as it is now, it exists that imbalance too, but in respect to infinite productivity. Instead, if Australia have better "sustainable development" than USA, despite the number of regions, the first one would be more or as competitive than the second. And, anyway, Australia can use the wars against his neighborhoods to achieve territories, as always. Very interesting. It would certainly change how wars are done, and make purchasing RMs interesting and valuable. I really like the idea. What I do NOT agree with is only the idea that you cannot move companies and that their location is fixed. If a government wants to raise a sustainability, you can't just tell someone to cut off their income. But if you can get people to move somewhere else and let the sustainability rise, they can still work. I don't fully understand HOW would you create this sustainability percentage go up and down. 2. resources never really run out physically. Also we should allow companies to leave to areas with lower wages - to better simulate how the RL economy is working ( jobs leave for slave wages ). After all if we want fidelity to RL we should follow what happens in it, right? ex: China can only bring into the USA Q7 tanks and nothing less. Or maybe Q1 tanks and nothing less. Implement a real protectionism VS free trade system of management. And we can go even further. Let workers have a special button they can access once a month called "STRIKE!" at which point the factory can no longer be used by the employer if there are 50%+1 worker striking. That way the minimum wage isn't the only limiting factor to how low the wages go. OK, I get your point. But, still, those companies must have a location, and maybe pay tickets or something to move on other region. Anyway, it would be still possible to destroy that company or sale it. Edited by Demonaire, 15 August 2013 - 04:50 PM. Raws employees' wastage rate: 0,001% per employee. b. Those "Recycling Plants" are too complex and advanced to a simple game like this. c. That would be a very good idea: to create a technological module as support to the economy (food, weapons, raw) and military (training camps) module. But the numeral 2 would go against my proposal. d. In fact, it already exists Only changing of citizenship. e. More like quality restrictions, it is better products restrictions. An taxes system individualized to each product would be excellent. f. And about the strikes... see literal b.
Edited by Demonaire, 16 August 2013 - 12:04 AM. Current "economy" doesn't provide room for such micro management, in fact it is a state-of-the-art simplification. (you read no-brainer) This is actually the part I differentiate from most, even though I'd swim in gold economy module would still be needed to fix on my own. That's the usual excuse the devs give and that people who don't want to think with more tjhan 2 neurons also give. "Oh this game is simple" well make it more complicated then. The more complex a game the less boring Don't get me started on the 'stupidification" of games nowadays. 1. My proposal is about to stop overproduction, If your idea was applied, will aggraviate that overproduction. Hence, your idea would be valid if it was demonstrated that an idea like mine had created a completely scarcity crisis. In other words, that "Recycle Plant" could be implemented in a long-term future. 2. By the way, How do I use that plant, if a weapon partially used can't be sold, precisely to avoid scam? From what i've read from articles with some preview info about the changes in the economy module, the admins are going for time limits on production (if you produce wrm you have to wait x hours until you can produce weapons and so on). I don't know if your idea would fit into that. The admins never make good ideas and think their brilliant instead of listening to the players. I mostly agree with Demonaire! Also, there is a great unfairness in the number of core regions a country has, as was mentioned. It is extremely unfair that some countries have 10, 17, 20 or even 50 core regions, while other only struggle with ONE! There is no way a country can develop in the game with such differences ab initio! A possible solution, too, could be to have resources jumping from region to region, so to say, once or twice a year, so it would be needed to develop strategies to control such resources. Buena propuesta gato, esperemos que te escuchen. Now, if that measure affects the market too, then it is a improper intromission and isn't going the solve the problem neither, in case of babybooms and high permanence rates, and, whatever, if is used some coordination, the overproduction still is going to exist. Pues la idea es que debatan para que esto sea un tanque de pensamientos, antes de mandar el respectivo ticket con el tema. Edited by Demonaire, 17 August 2013 - 04:08 AM. Weapons could have a visible "life" bar. The more of it used up the more that can be recycled. Of course we could implement a more complicated formula and add the "time limit" factor in the term of "obsolescence". Tanks RUST in, let's say 30 days if they don't get used up. I dunno, the possibilities are endless. The fact that it exists in many games doesn't mean that isn't an improper intromission. And repeat: that isn't going to stop the overproduction.